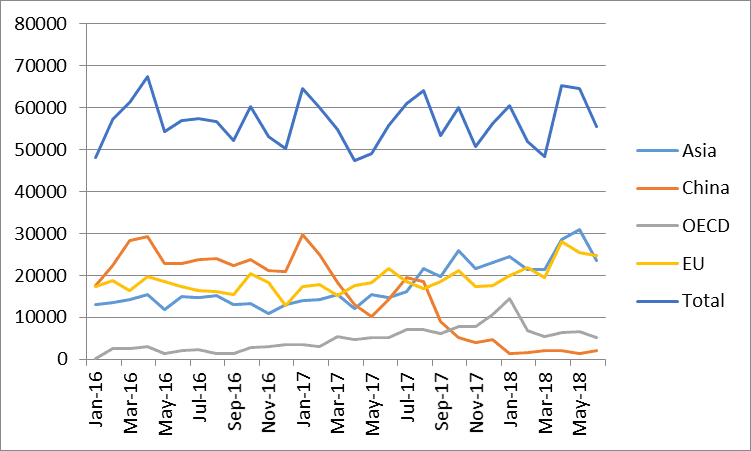 For those close to the coal face, the question on the lips of many in the plastic recycling and waste sectors is whether we are facing a Domesday scenario for exports of UK plastic packaging waste which have, over the past decade, increasingly underpinned the UK’s ability to meet EU recycling targets. As the graphs illustrate, the restrictions on the import of solid waste into China announced 12 months ago have resulted in the emergence of new markets in Asia, as Chinese recyclers migrate activities to countries such as Malaysia, Indonesia and Vietnam. Consequently, around 60% of the plastic packaging collected in UK for recycling has continued to be exported. 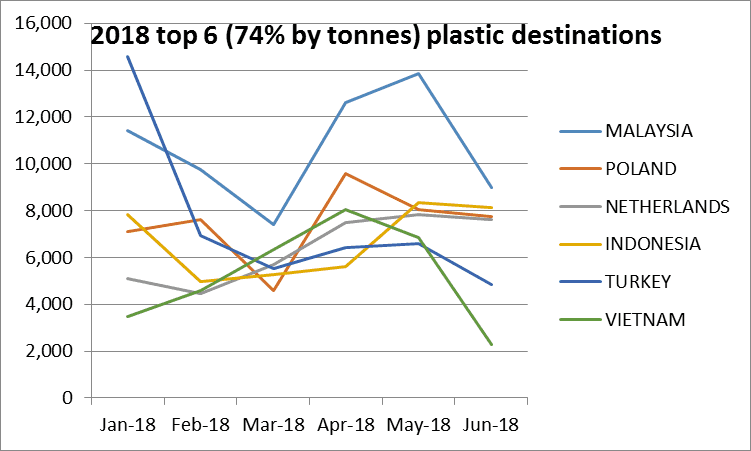 However, since the publication of 2018 Q2 data, we have seen further restrictions on the import of plastic waste for recycling into these countries, with tales of log-jammed ports full of household and other low quality plastic waste from the developed world. On top of this we have reports of EA investigations into suspected illegal waste shipments to Poland, with the prospect of around 1000 tonnes of waste exported for recycling being repatriated to the UK. These developments should provide serious concerns about what the Q3 data is going to look like and the government should now be considering what action it can take to mitigate this. The National Audit Office has been highly critical of the UK’s recycling strategy and has echoed many of the BPF Recycling Group’s concerns, contained in its proposals for reform of the PRN system as well as the proposals to incentivise and encourage plastic recycling. The best that can be said of the PRN system is that it has delivered lowest cost compliance but as we have seen in the mainstream news media, there is an environmental consequence of a flawed system that has encouraged the export of low quality contaminated household waste to largely unregulated markets for recycling. The obvious question is: why aren’t we recycling these plastics in the UK? Apart from the economic consequences of an export-led recycling strategy that has helped to drive so many UK household plastic recycling facilities to the wall over the past few years, one of the real problems is that we have no real understanding of what type of plastic packaging is being exported — bottles; pots, tubs and trays; film or even, as some have speculated , whether it is obligated plastic packaging waste at all. Similarly, there is no requirement for UK recyclers to declare the types of plastic packaging or the polymers they are recycling. 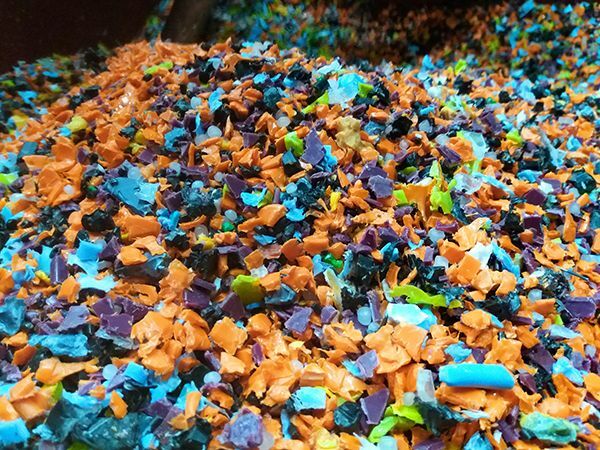 Consequently, we have a completely inadequate understanding of what type of infrastructure and capacity is required to recycle the various types of plastic packaging in the UK. The real sadness is that this information could easily be obtained by ensuring that accredited recyclers and exporters are required to include this information as part of the existing accreditation process – a point that has previously been highlighted by the Government’s Advisory Committee on Packaging. In relation to exports, there is a widely held view that the UK should adopt the Scottish requirement for mandatory registration of annex VIIs as part of the PERN reporting procedure. In short, there is no need to reinvent the wheel – just to amend what already exists (in the National Packaging Waste Database). The mood music coming from Defra seems to be concentrating on making plastic packaging more recyclable through a ‘modulated’ PRN system. Whilst this is good and greater recyclability is to be encouraged, let us not forget the current real-world issues UK recyclers face. Here we have a choice: to drive investment, encourage innovation in new technologies such as chemical recycling and futureproof end markets for recycled plastics by driving up material quality through robust UK collection, sorting and recycling infrastructure — or to simply rely on comparatively low cost, less regulated global markets, which may or may not exist. The Q3 data will be revealing. In light of recent news coverage and press statements, the last thing the country needs is anything further undermining of the public’s confidence in plastics recycling. Should the Q3 figures be bad, the real concern is the potential for misinterpretation. We do not need more misleading, unjustifiable headlines proclaiming that plastic is unrecyclable, which will ultimately result in more confusion and less material entering the recycling stream.